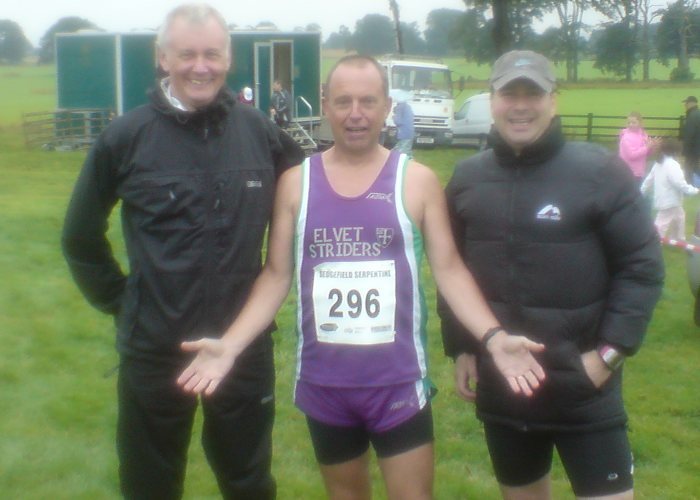 The Staveley Stampede - 10 mile (or so they said) - a brand new mixed-terrain race for 2008 based in the lovely Yorkshire village of Staveley (just off the A1 at the Boroughbridge turn). The weather was a bit humid but not too bad for a 10 mile run. The day started well as I found the start with little bother and was at race HQ in the local village hall just after 10am. The village was out in force already preparing the food for the after party on 2 large barbecues (the burgers were very good at the end of the race) and numerous cake stalls for the more discerning runner ... why have carbo-gel when you can have a home cooked muffin? The race started at 11am and I set off at a good pace on the local roads. However, when I reached the 2 mile marker I checked my watch and was disappointed to say the least when my watch said 26 minutes. I thought I had started well and kept trying to glance at other runners' Garmins to see what was going on. No joy on that front so I got into a rhythm and kept plodding on. At the mile 4 marker on the cross country section I asked the marshal a seemingly stupid question - 'how far have we run?' The answer ... 'about 6 miles mate'. From there the last 4 miles were mainly on tracks and road back to the village hall. So the inaugural Staveley Stampede 10 mile race turned out to be about an 11.5 mile race thanks to the first marshal on the very first bend who sent us all on an extra loop. Hopefully next year they will get it right and if so I would heartily recommend the race (and the village pub). This event meant a trip of fifty-five miles to try out a new ten-mile race at Staveley near Knaresborough. The race was advertised on a web-site and took on-line entries. They sent a very comprehensive race-pack with a map and description of the venue and the race itself. Race headquarters were in the village hall, which had produce for sale outside and there was a barbecue afterwards. And then what happened ? The runners were all sent the wrong way by the very first marshal! I wondered what was going on when a van, which had been at the start, passed the race tooting on its horn. After a while we were all directed back to the race route by another marshall shouting, "You've all got an extra two miles to run!" The extra miles, in one sense, added to my enjoyment as, instead of my usual head-down, check the mile-markers effort, I enjoyed a long conversation, over the first four miles or so, with a fellow runner. He was brought up in the area and said that at one point you could see Menwith Hill to the west and the White Horse on the Cleveland Hills to the east - if it hadn't been so misty! As we went through Staveley, apart from pointing out the old station and the cricket ground, he waved to a couple outside their house, saying, "She was an old girl-friend of mine!" You don't get that in most races! Weardale Show is one of the smaller shows in Weardale tucked away high in the dale at St John's Chapel. A few shows around the region had been cancelled due to the wet weather but this one went ahead and was very well attended. The livestock were back this year following an absence last year. The race was, as usual, fairly small. Dave Robson, Phil Owen and I were the three striders making up a field of dozen or so seniors. I had to return my shield from last year and was unable to successfully defend my title. The Durham City Harriers Summer Relays are a fast flat blast around the Maiden Castle sports fields with teams of three running 3km legs. With a rush of last minute entries there were 5 Striders teams (out of 31!) taking part this year. It was the usual exhausting fun against the usual opposition of young whippets. If it hadn't been for Jan's announcement on Wednesday's club night I would've missed this steep and cheerful race. I was having second thoughts right up until the last minute about tackling something this tough, but the temptation was too strong and the weather too sunny to let it pass by. At 13 minutes past something-or-other I set of in a group of four and settled into a steady pace. The weather was great and the scenery superb. I was enjoying this leap into the unknown, with little idea what lay ahead. Probably just as well. After a mile or two of steady climbing and following the arrows we had a steep descent. I gleefully charged down through the conifers to emerge on a forest road. Looking optimistically around for more arrows I was soon joined by other reckless descenders. In a matter of seconds there was soon a jolly little party of about a dozen head-scratchers, all vigorously agreeing that we didn't know where we were, or which way to go. The seconds ticked by as we elected a foreman of the jury and started weighing up the evidence. Soon sub-committees formed as people became restless. I looked around and noticed we all had 'big numbers' on, which meant we were all new kids in the race (the old-timers get small numbers). It wasn't long before people started wandering of in various directions and I decided to cautiously retrace the route back up the hill. Almost immediately I spotted someone with a small number - an old hand - and gave chase. I was back on course! (Debs said later that she had made the same wrong turning but someone had shouted after her before she got too far away). This was fun! I'd lost a couple of minutes on the detour but who cared! I passed someone that I'd passed some time earlier, somewhat to his bewilderment, and charged on. We dropped down the valley and started up the other side. I started walking up the steep slopes and the flies began to take an interest. I tried to run again to get away from the flies, but my lungs and legs didn't like it. I settled for the flies and slogged up the hillside as they buzzed mockingly around my head. I had been reading about the Burnsall fell race in feet in the clouds. A 1.5 Mile race virtually straight up and down. Part of the Burnsall fate/sports day that is thought to be 400 years old. The classic race is famous mainly due to its age (its thought to be the oldest recorded fell race in the country) and because of Ernest Dalzel who in 1910 after cycling down from Keswick (2 hours in a car) the night before ran the race in 12 minutes 59.8 seconds with a descent of 2 minutes 42 seconds. It was so fast the timekeepers refused to believe there watches and would not register his time. It took until 1977 when Fred Reves ran in a specially arranged race in 12.48 thus proving that it was possible and it was likely Ernest had done that time after all. I was fairly sure I would not be troubling the record! However, before the fell there was a little matter of the 10 mile road race. Just before the race I met john, a Fetchie we often see at the more scenic races. John had a program in his hand and asked what my best time for a 10 was and then to look it up in last years results. Hmm, not quite last but not that far of it. Looking about at the start there were clearly lots of good club runners. In fact I can't remember anyone not in a club vest at all. A large crowd left the grassy banks of the river wharfe and the traditional fair to see us of. Tradition is a theme that runs through the sports day and fair. It's the first time I had been in a race that was started with a proper starting pistol. What a bang. Those standing next to the starter certainly knew about it. In excellent weather, we set of by the large tree next to the bridge as tradition will have it, brass band playing and of over the stone bridge away towards the town of Grassington. Majestic sweeping views of the river wharfe & valley followed as we took to the country roads. A short sharp climb to Grassington and a good crowd cheered us on through the south end of the village and down a sharpish descent. Sharp climbs and descents with nothing to taxing but good enough to let you know you weren't doing any old 10 miler were the order of the day. At about 6 miles, i could here a runner steadily catching me but every time I came to a hill I would pull away from her. On one of the few flat bits she came along side of me and we had a chat. She was 20th lady and was hoping to catch the lady about 400 metres ahead. As she went past I saw on her vest, 'women's running network'. I had over he past couple of days exchanged f-mails on fetch with an Alison asking me if I knew if you could enter this race on the day. I had replied that the entry form did not say either way but I would just go for it. (you can by the way). I noticed on her profile that she was a leading member of the WRN and of course it was her and as I passed her up the next hill we had our own little race. Every flat she would overtake me and every hill I would pull away from her. She warned me of mile 8-9 as a really decent long hill and sure enough it was a really excellent grinding climb and I left Alison again. From the top it was now a mile of descent. Sure enough as we entered the village to a large cheering crowd, Alison overtook me and beat me by 6 seconds. An excellent race. I now had an hour before the fell race. As I said before, this place has an emphasis on tradition. Apparently according to the book feet in the clouds it was once mentioned in the local paper when the brass band that play all day, played in a slightly different place then the norm ! The fair consisted of Punch and Judy, coconut shy, tug of war, chucking eggs at each other, wheelbarrow races,pillow fights and that good old tradition of hitting a target that then drops a child into freezing cold water. In addition there were about 6 age grouped races of about a mile, all starting by the tree and finishing in the same place alongside the fair field next to the river to the applause of a large crowd. With the junior races finished the Fell Whippets lined up along side the tree for the classic 1.5 mile fell race. I tagged onto the back not wanting to get in the way of the fast lads. The history of this race brings out some of the best fell runners in the areas all hoping they might break the record and have a piece of history to there name. I was just along for the ride with a race plan of tag onto the back, get up the hill, not get in anyone's way and see how I feel of we went down the only bit of tarmac and onto a boggy field. I tried to run the entire climb but found it almost impossible from about 150 metres from the top. It's the steepest hill I have ever come across, 1,350ft in less than a mile. Its not exactly straight up as most take a slightly zig zag line up the fell but its not far from it!! The upwards terrain is mainly boggy field followed by a step narrow single track . Deep furrows mean you have to scramble up parts on your knees and all the rain has turned them very slippy. Finally at the top I catch my breath and although I was meant to be just tagging along at the back for the ride, i find i'm now kicking myself for not really going for it harder, despite the 10 mile race before hand. From 2nd last place i decide to descend as fast a possible. I round the flag cairn, put up at 7am that very morning as on every sports day morning by the fitton family and see the drop. Hell that's steep. I wind down the initial 10 meters that curve round the rocky outcrop that the flag cain sits on and then it's a deep furrowed path of mud and rocks straight down. The furrows are fraught with danger. Large rocks covered in mud are lethal and to make matters worse the bracken covers most of it so its really hard to see your where you feet are going. I build up speed and catch a couple of runners. The first I have to step round but the second I have no where to go and either side of him. I know there no obligation for him to move aside but I shout 'Please' at the top of my voice. He kindly, moves aside which is just as well because I really can't stop now. The hill flattens out at the wall. In feet in the clouds it says the fell runners leap this but instead of the 2ft on one side and 6ft on the other in the book its more like 4ft and 5ft on the downside. I scramble over and continue the descent. The footing is better now and I going as fast as I can. I pass a few more so i'm not going to be last anymore.. Across the last field and back into the village I sprint for the line and immediately collapse on the ground exhausted.1.5 miles but what an exhilarating race. Ten minutes later I'm standing with most of the other runners outside the Red lion pub with two pints of real ale, not more than 10 yards from the finish. Now that's what I call a good tradition. George Ogle telling us all at the start that there were very muddy sections of the course, and that we were to do three laps gave this race a flavour of the Harrier League. Luckily the rain held off, and seven Striders set off onto the course - mainly on tarmac footpaths round playing fields and a country park near the Robin Hood pub in Jarrow. As advertised, though, about a quarter of each lap was on heavily waterlogged grass, which slows proceedings down a bit. Quite a nice course, adjusted at the last minute to avoid the worst of the mud - though the distance ended up closer to 7 miles than 10K, which explained the times being way down on what we all may have expected. Into the pub after for the promised "Pie & Peas" - or for the veggies in the party, "Peas". Not the best pies I have to say - more like a flattened Eccles cake with a bit of mechanically-reclaimed meat slurry in it - but the beer was excellent. As an extra bonus, most of us ended up getting bitten by something like a horsefly, or else very potent midges. This is quite a well known race on the coast of Wales north of Aberystwyth which is in its 25th year. I had heard that it was pretty tough and included running across a specially ploughed field and running along a narrow path along the side of a hill for a period. Plus of course there was the challenge of racing against the train, but I rated my chances of beating the train as slim. As my son live in Aberystwyth, a few miles to the south, the logistics seemed great. When we got to the race HQ I was surprised how big an event it was, there were runners from clubs across the country and beyond - there were some runners with shirts that said 'Rail Runners'. Somebody suggested to me later that a T had fallen off at the front, but no they were from Holland and the club is based around a rail company. Because of the link with railways, two of their number had come over to do the race about five years ago and loved it so much about thirty of them now come over every year. There are four races, 3.5m, 5.5m, 10K (all in the morning) and the 14m in the afternoon. Glen did the 10K and was able to tell me a bit about the second half of the 14m. It was quite easy to see that it was going to be muddy ! Rain had been forecast all day, but the morning was cloudy and threatening, but the rain held off for Glen's race. The 14m race is 7m up a valley and 7m back on a slightly different offroad route for some of the time - the first 3m and the last 3m are the same. There is probably about 2.5m on road, the rest is track, path and fields. It was very muddy as the ground was waterlogged after a week of heavy rain. At about 5m the heavens opened and it rained very heavily for the next 40 minutes before drying up for the finish. The first half wasn't particularly challenging, but the second half was harder. The path along the side of the hill was very narrow and the hill was very steep and anyone trying to overtake was in danger of taking a tumble and I saw it happen. After at least a mile or so of that, we plunged downwards into a ravine with a lovely waterfall before climbing steps out of the other side of the ravine. Then we entered a short bog section where I went up to my knees in mud. Then we came to a very hard part - running along the side of a steep hill where there was no obvious path with your ankles bent over - very uncomfortable. I kept wondering when we were going to hit the ploughed field, but there wasn't one this year. The route was pretty close to the narrow guage railway line and there were two trains to try and beat. Each train stopped for a period and was full of spectators shouting encouragement at the top of their voices. Runners who attempted to wave back and took their eyes of the track sometimes fell over ! I failed to beat either train, but it was a great run - well organised with lots of water stations and friendly encouraging marshalls. I bumped into a few people I know (some also from the north east), so it was a lovely day ! If you ever get the chance to do this race, do it, its fun ! Thanks to the 17 brave souls who got very, very wet and muddy last night. The weather was awful and so I'm very indebted to the professional umbrella holders in attendance, the Daves. The results, once my papers had dried out, had Amanda finishing first with newcomer Grahame close behind. Geoff Watson was fastest runner on the night. There was a lot of bunching around the estimated finish time of 20:05, which is good. I was going to do the Darlington 10K on Sunday but I really didn't fancy another road 10K as I have done a fair few lately. So when I saw Will's e-mail with this fell race I thought I would give it a go. I arrived at the meeting point, the Gate Pub in an hour before the race. The FRA website said from the gate pub which sounded like a good idea to me. Parked up and wandered up the hill toward the few runners gathered around Will's car. Said Hello to Will and paid my £3.00 and was given a number that said I was doing an All Terrain even in Hamsterly Forest. Looking around at the few runners present they all had numbers with different events on. The Snape 10, Saltwell Park 10K, Richmond Castle,,,,, but not two alike. 'Great' I thought. I can win 'my' event! When I started running a year ago I was worried about coming last in my first few races and as the race time approached, men made out of wire and sinew seem to materialize out of nowhere ready to race. My fears were back. Bloody hell - reckon I weigh more than this lot put together! Will took about 40 runners over to the start in the next field. As we waited, shotguns started blasting away to our right. This run was meant to be part of the Simonside show but this had been cancelled due to water-logging. This wasn't going to stop the Farmers blasting Clay pigeons out of the sky though. Will pointed to a bit of ground, and said 'the starts about here' to much laughter - told us not to get run over when we crossed the road and its impossible to get lost. Another laugh at this and Will back tracked to say 'almost impossible to get lost' with that and a quick shout of 'GO' we were off. Now I say 'we' but the wire men flew down the field with me trying to hang on in last place. Over a field of high grass, cow pats and thistles we went heading over a small rise and then down to a stream. Through the stream and up the other side. The 2nd last is now 200 meter in front of me. Hell we have only been going a few minutes and my heart was leaping out of my chest! Across another field of long grass and over the deserted road towards the hill. Not a great hill but enough to slow some of the runners down and me to gain a little ground. Overtook a couple of runners and up towards the hill and over the top. The main peloton were only just in sight now and heading back down to cross the stream but in a different place to that which we crossed earlier. As I got down to the stream I totally lost sight of anyone, but a Marshal was there to guide me. I followed her pointed finger, straight through head high bushes and brambles-surely not! Out the other side and had no idea where to go next when I saw another Marshal pointing towards the stream. Waist deep this time and very slippy rocks (later saw a guy with legs like Mandy's [see Sedgefield report] from a fall here). Up a very muddy bank and over another small hill. No discernible path was visible and I could see no red tape but I could hear Gunfire! Upwards and onwards towards the blasting and I could see the finish with all the wire men looking relaxed and fully rested after finishing some time ago. Not quite last but far back enough to be asked if there was anyone behind me. God, for a short race that was hard. Give me a half marathon where I can get my pace together any time! Well not really. It was great, finished at a pub and a prize of a bottle of beer! I will definitely be doing more of these despite my lack of speed. PS. The winner was the same lad who won race the tram and the Stanhope fell and everything else he has entered. He must be getting a bit bored though as he swapped one shoe with his brother just before the race and ran in odd shoes for a laugh. Seven Striders made it to this race. The organisers keep fiddling with the start of this race. This year it was almost the same as last year except they had moved the start back 50 yards around a corner and consequently the finishing straight was a little shorter. The weather was all over the place, sometimes sunny, sometimes light rain and sometimes very heavy rain, but none of of those variations lasted for very long. Congratulations to Andy for his new PB ! A very damp run looked likely driving down to Sedgefield for this one, but helpfully it eased off just before the start. Quite a nice course, through fields on tracks, and some bridleway. A bit slippy in parts, but all in all this was a very pleasant bimble through nice countryside. Lots of marshals, though some of them needed a bit of a nudge to get them to tell you where to go next, so I wasn't entirely surprised when Mandy said afterwards that she'd missed a turning and ended up in brambles - with a bleeding leg to prove it. The advertised 6.5 miles turned into close to 7, but this was a nice run. The two Geoffs both had good runs, finishing in the top ten. Every Strider ended up in the top four for their age group (is this a first? ), and Wendy was first F55 gadgie - err, sorry - lady! Part of the Lowther show and horse trials, this half marathon fitted the bill. A decent distance and being just south of Penrith, on the edge of Cumbria it promised to have good hills and fantastic scenery. Added to the fact it was on a Friday afternoon when I should be working-even better! Dave Robson and I arrived at the show field that looked decidedly wet. Changed and headed down to the show we met John a fetchie who we often bump into at races, particularly the more scenic ones. As we walked down the hill the ground became more and more water logged. Trail shoes were a good choice! Tractors were being used to transport stuff around the show and there massive wheels were churning up the ground all over the place. It wasn't really a surprise to me to find out the show was cancelled the following day. We registered with about 100 other runners and were taken down to the start at the bottom end of the show field. A terribly dull bloke on the mic, mouth loaded with plums and no idea what was going on garbled something about a fun run to little merriment. Start time and of we went, taking a course around the planned start route as it now resembled a ploughed field. We headed out through the trees, along the river and were soon climbing over fells into the hills. More steady climbs followed as we climbed so did the sun. We eventually we crested the hills in blazing heat to be rewarded with a fantastic view of Northern Ulswater, sailing boats gleaming in the sunshine. My photos probably don't do justice to this fantastic view but as usual they are taken on my camara phone on the run. (Took three work calls as well by the way). Along the tops on grassy trails and back down the hills picking up some narrow tarmac roads and winding down through the hills and farms we eventually ended up on country roads. Dave as per usual was in sight most of the way but I lost sight of him in the last mile as he speeded up down the descent back toward the show. We entered the show field at the castle and finished down a boggy straight. Great race, not unlike the Lakeland trail races.